BUDAPEST, Hungary (AP) — Hungarian Prime Minister Viktor Orban will be traveling to Brussels to attend a meeting of the main center-right alliance in the European Parliament, set to discuss the expulsion or suspension of Orban’s Fidesz party from the group. Thirteen of the European People’s Party’s 49 full-member parties are calling for Fidesz’s ouster after years of disagreement. EPP delegates will meet Wednesday in Brussels to debate the matter, one of several on the agenda for the occasion. Some EPP members believe Orban — known for his anti-EU rhetoric and anti-migration views and policies — has strayed too far from the alliance’s Christian Democratic values. Manfred Weber, the EPP candidate to succeed Jean-Claude Juncker as president of the European Commission, has called on Orban to meet certain conditions to stay in the alliance, like putting an end to the anti-EU campaigns and allowing Budapest-based Central European University, founded by Hungarian-American financier George Soros, to continue issuing its U.S.-accredited diplomas in Hungary. While pro-government media in Hungary have called for Fidesz to leave the EPP and are increasingly critical of Weber and EPP President Joseph Daul, Orban appeared to favor staying. Fidesz has 12 deputies in the EPP group and polls expect the party to win up to 14 seats in May’s EU parliament elections. The EPP is forecast to lose nearly 50 seats from the current 221. Weber has repeatedly said that Fidesz’s status in the EPP depends on its adherence to EU democratic values, not the number of its deputies. 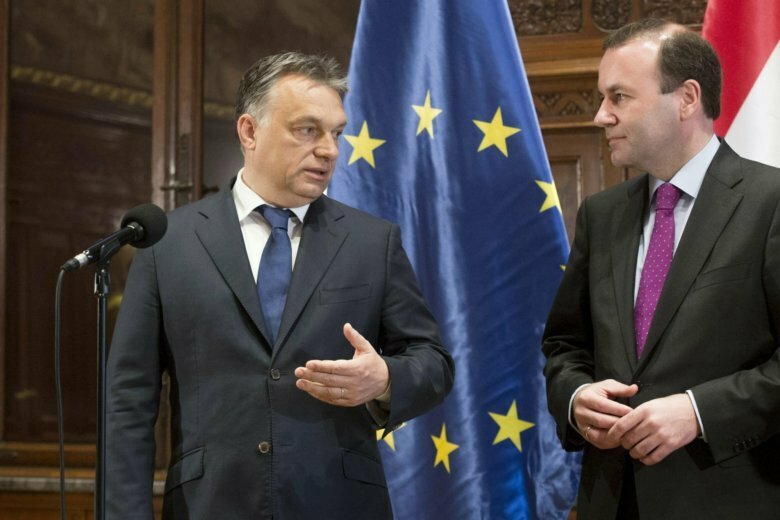 “We want to guarantee that Fidesz is committed to EPP values and Hungary is a clear pro-European country which sticks to European values” including democracy and rule of law, Weber said last week during a visit to Budapest to meet with Orban. Analysts say Fidesz’s continued presence in the EPP could complicate Weber’s ambition to lead the EU’s executive Commission. “The biggest problem is that Manfred Weber needs the votes of the greens, but most probably the socialists and the liberals, too,” to secure the post, said Peter Kreko, executive director of Political Capital, a research and consulting firm in Budapest.